"Nuclear? No, thanks" In Montevideo, Uruguay. Photo: loxitu helada. License: Creative Commons. Original. flickr. Although Uruguay since 1992 has a law forbidding the use of nuclear power, the issue came up again under the “progressive” government of former president Tabaré Vázquez, when feasibility studies were proposed in a governmental energy policy plan together with gas and coal plants – up to then Uruguay based its electricity needs mainly on hydroelectricity. Background were also the projections of growing demands, although any big scale nuclear power plant would have exceeded by large the real needs – some politicians therefore started to talk about the chance of exporting energy to other countries in the region. Within the last years, the debate about nuclear energy had its forums, mainly pushed by international sellers, but also by a strong and mainly opponent civil society, which gave the battle whenever it came up. As the situation in Uruguay concerning the lack of an scientific-technological or specific institutional infrastructure is very much the same as in Chile, the quest for nuclear energy in this small country with a population of only 3,5 million inhabitants seems somewhat bizarre and to a certain extent also to be related more to prestige –and lobbying- issues than a real need. 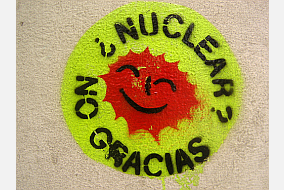 However, in last year’s national budget the government designated 1 million US-Dollars for feasibility studies, although it did not publish completely a 2009 survey on the opinions of Uruguayans about nuclear power – one of the few results to be known is the fact that most Uruguayans wanted to know more about the nuclear issue. Last year, partners of the Heinrich Böll Foundation participated in a “Citizens Tribunal” at the University of the Republic in Montevideo, which finally had a negative verdict by all of the 15 academic “judges”. At the same time, the energy ministry of the government worked on an energy plan for the next 25 years focused on a great increase in renewables, sustainable biofuels and energy efficiency, which would make a nuclear power plant obsolete – at least until 2035. Uruguay last year adopted a renewables law, which de facto promotes renewables, specifically wind and solar energy broadly – the goal is to have 500 MW of wind energy installed until 2015. Looking at further potentials for renewable energies –and efficiency strategies- the nuclear idea seems senseless. Although the lobby groups, as in Chile, in the last days started again their campaign with expert opinions and analysis in the media, Uruguayans, in spite of the strange and only partly published survey, are being generally skeptic on the issue, and more after the disaster in Japan.